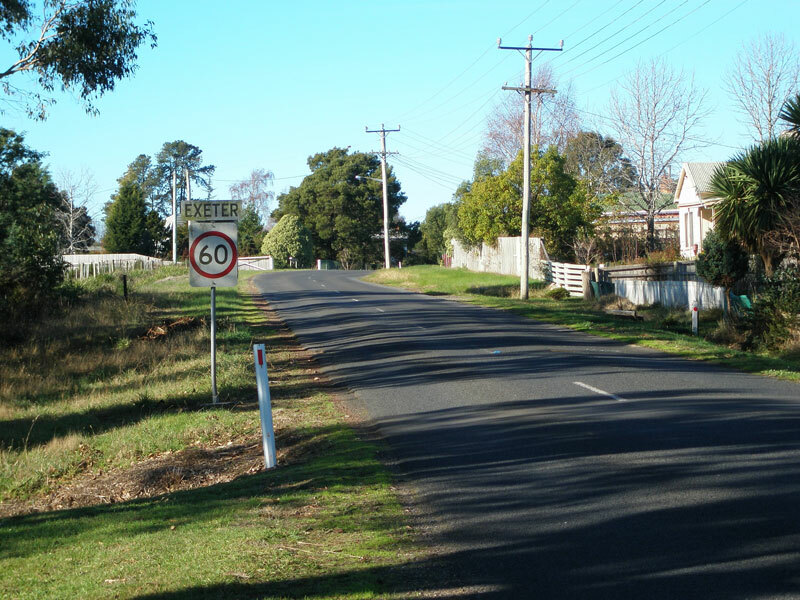 Fingerboards at the junction of Winkleigh Rd (C717) & South Winkleigh Rd, Winkleigh. 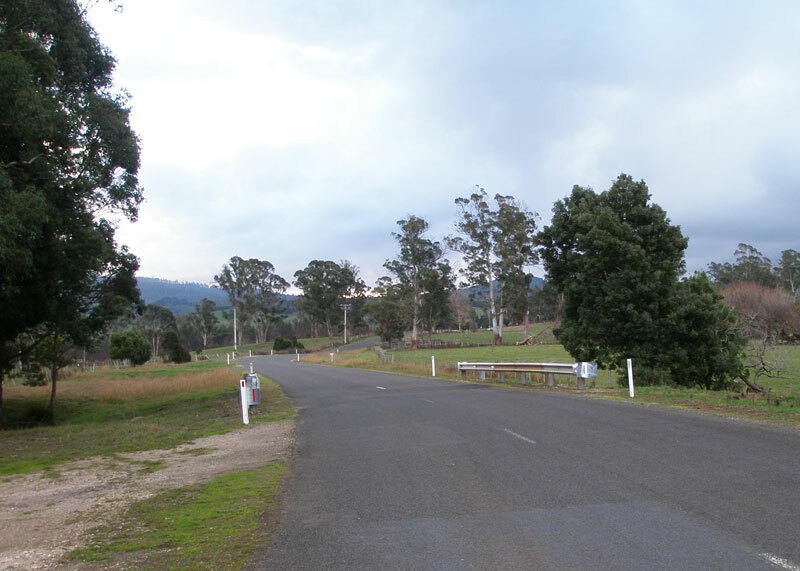 Source: Peter Renshaw, June 2007. 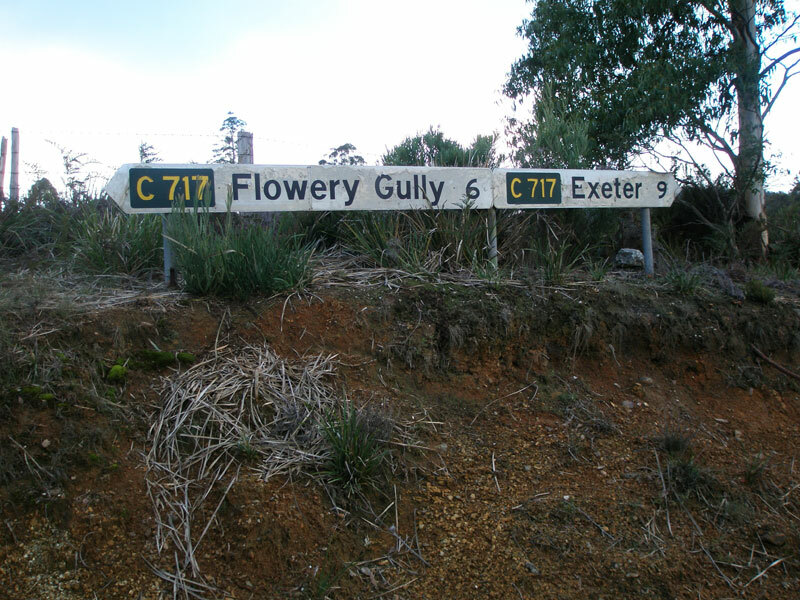 Focal Points: Exeter, Winkleigh, Flowery Gully, "A7"
Route C717 is a rural loop route from the A7 (West Tamar Highway) between Exeter and Beaconsfield. 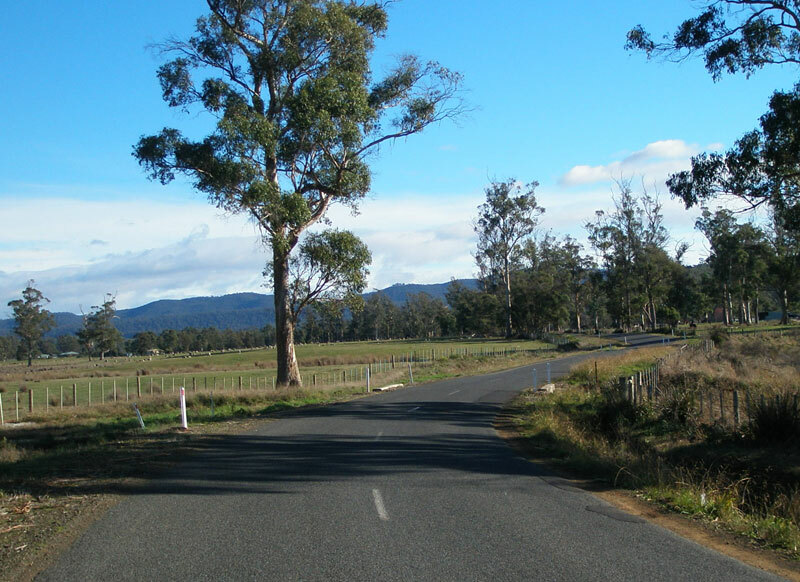 It has one tourist attraction - the old Supply River Methodist Chruch - otherwise serves the agricultural and logging communities of Winkleigh and Flowery Gully. Two large quarries ensure that C717 is sealed, and constructed to a good standard, throughout its length. Fingerboard/ID signs at the junction of West Tamar Highway (A7) & Winkleigh Rd (C717), Exeter. 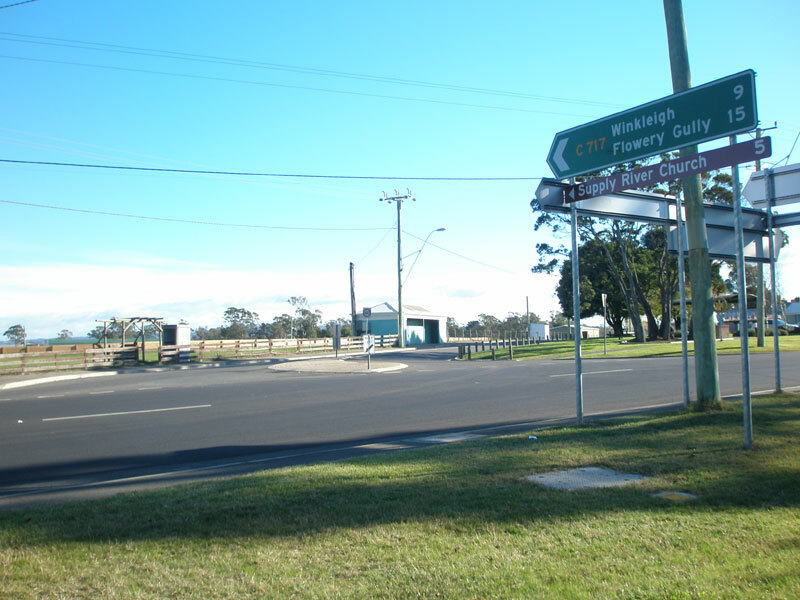 Winkleigh Rd (C717), looking south-east to the junction with West Tamar Highway (A7), Exeter. Winkleigh Rd (C717) looking north-west as it leaves Exeter. Winkleigh Rd (C717) looking south-east as it enters Exeter. 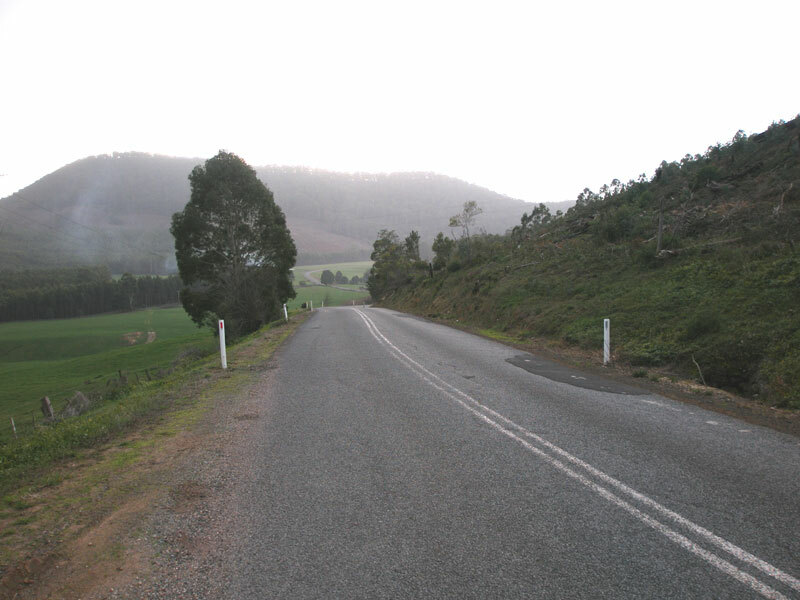 Winkleigh Rd (C717) looking north-west, 1km out of Exeter. 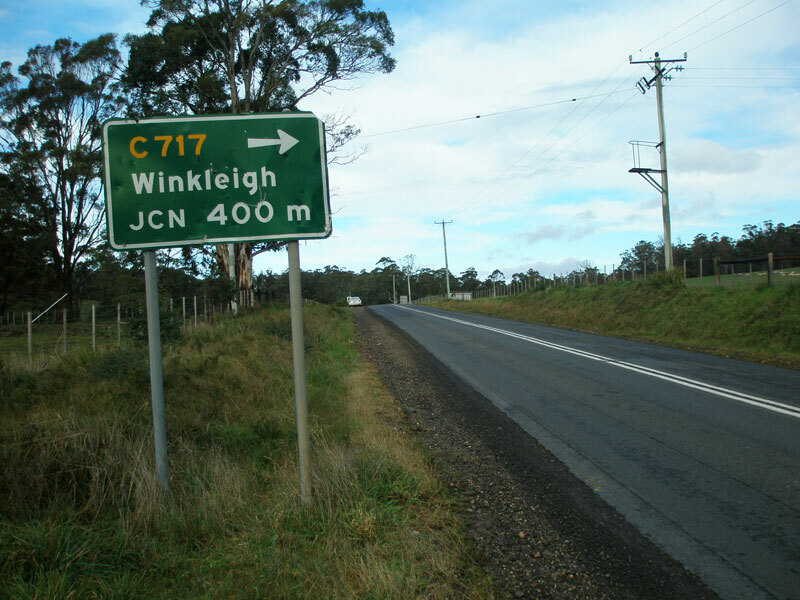 Winkleigh Rd (C717) heading north-west, approaching the locality of Loira. 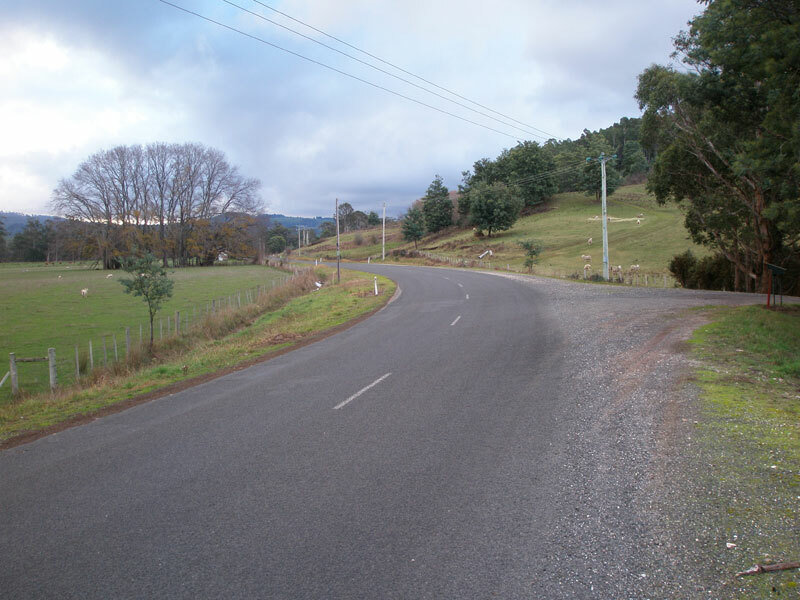 Winkleigh Rd (C717) looking west from Crawfords Rd at Loira. Winkleigh Rd (C717) looking east towards the junction with Crawfords Rd at Loira. The historic Supply River Church is on the left. 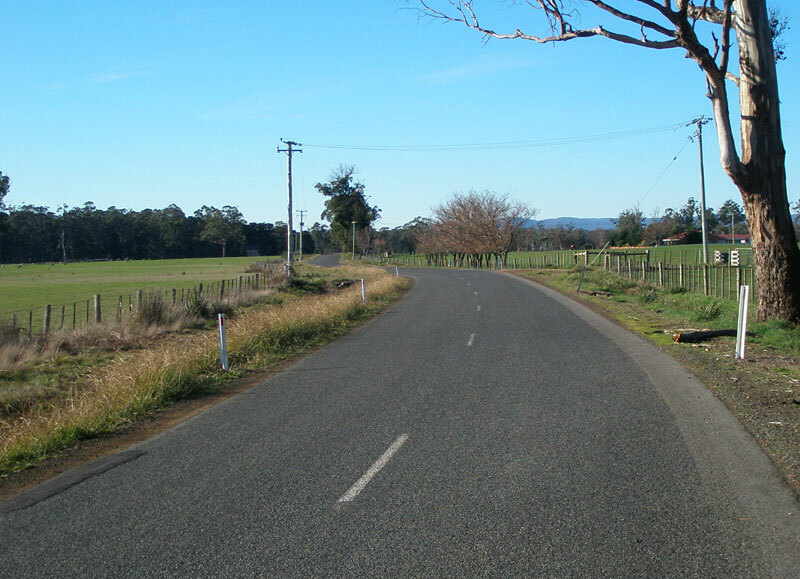 Winkleigh Rd (C717) looking west between Crawfords Rd and Glengarry Rd (C718), about 4km west of Exeter. 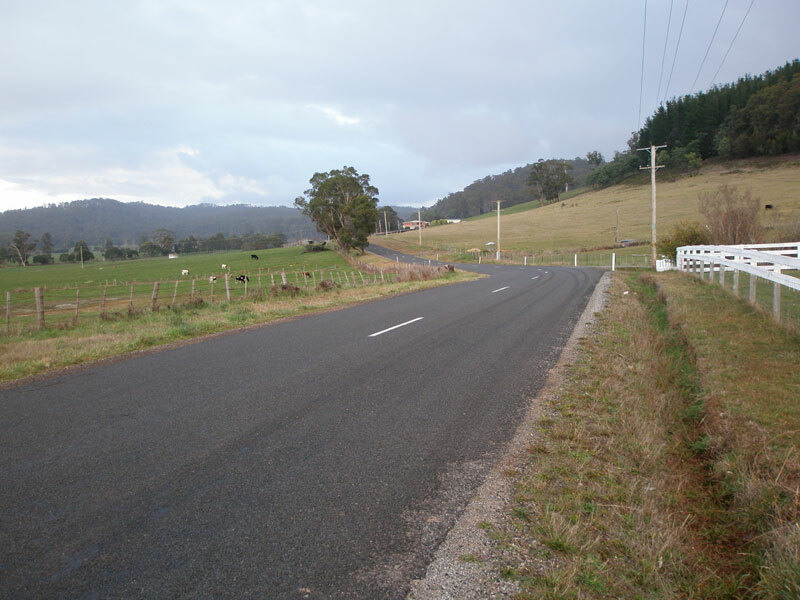 Winkleigh Rd (C717) looking east about 2km from Glengarry Rd (C718). 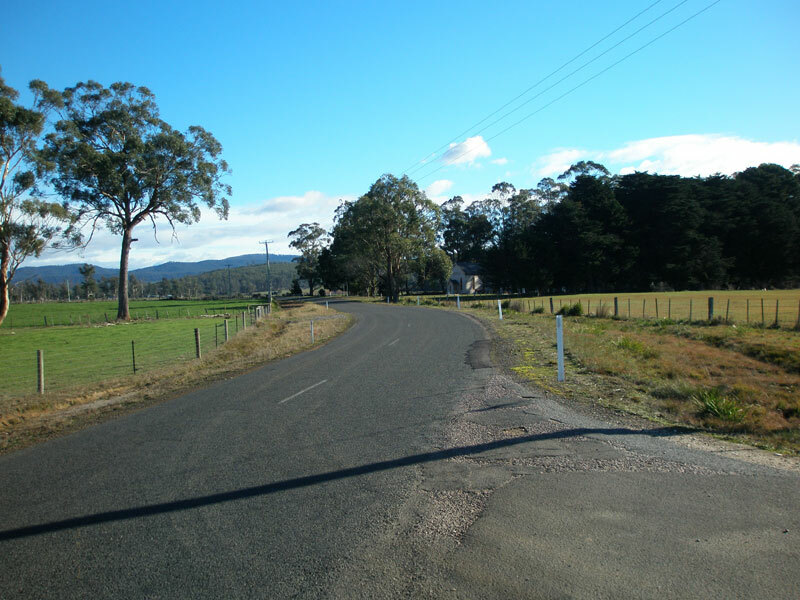 Winkleigh Rd (C718) looking west about 1km from Glengarry Rd (C718). 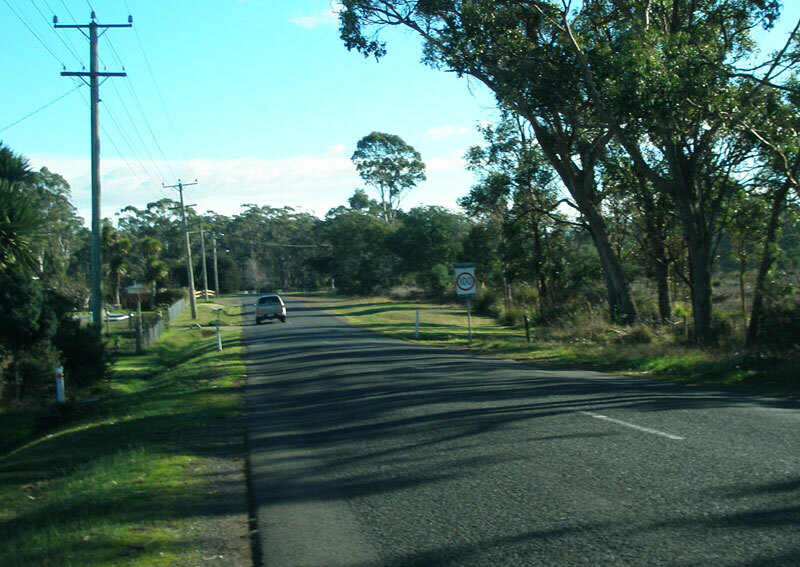 Fingerboards at the junction of Winkleigh Rd (C717) & Glengarry Rd (C718), 7km west of Exeter. 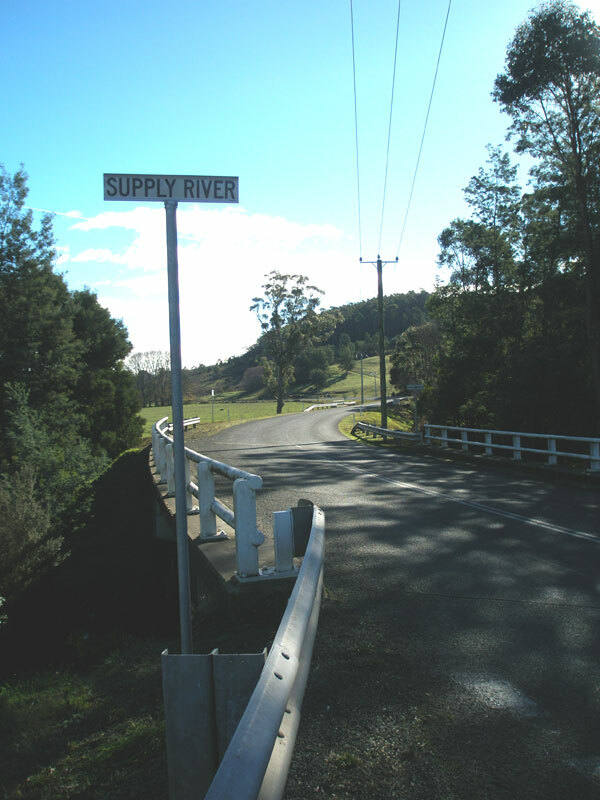 Winkleigh Rd (C717), looking north-west across the Supply River, just west of the Glengarry Rd (C718) junction, 2km south of Winkleigh. 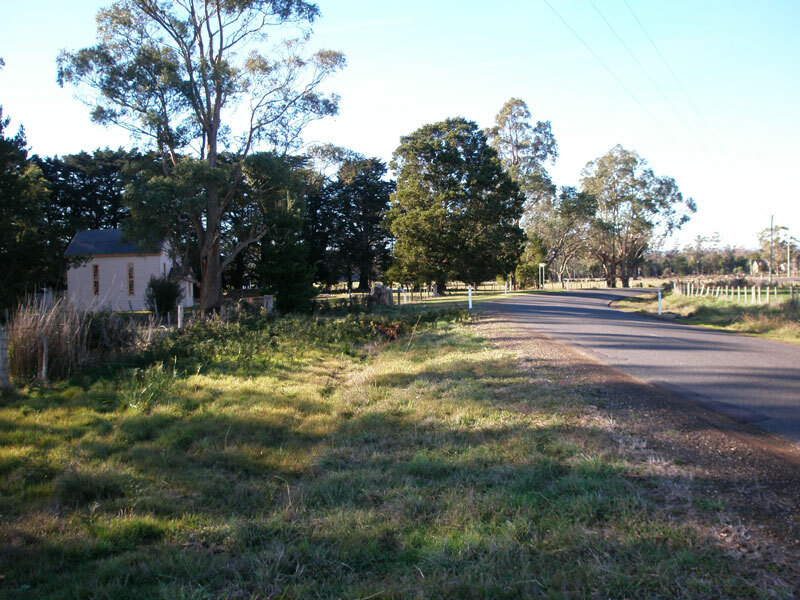 Winkleigh Rd (C717) looking south towards the Supply River bridge and the Glengarry Rd (C718) junction. Winkleigh Rd (C717) looking north from the same spot as the above photo - I love this sort of light, it brings out the most beautiful colours in photos! Winkleigh Rd (C717) looking north approaching the junction with South Winkleigh Rd at Winkleigh. 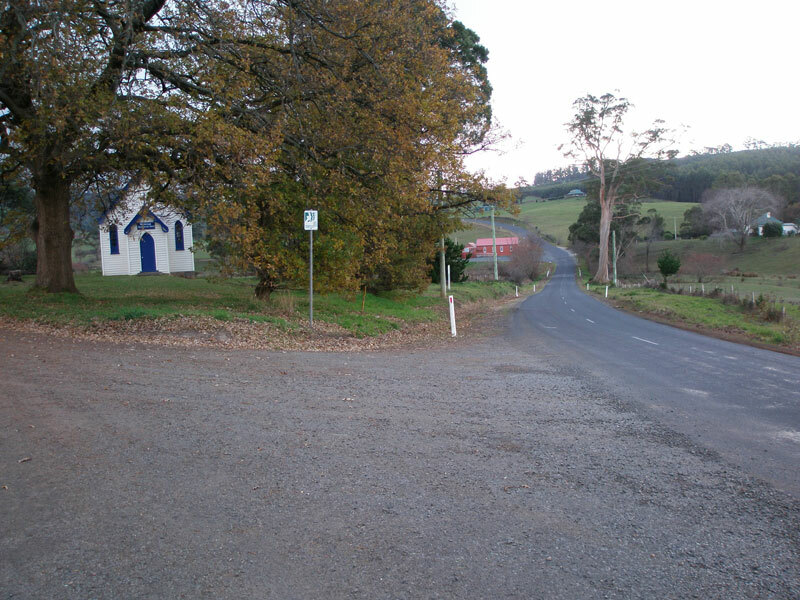 Winkleigh Rd (C717) looking south at the junction with South Winkleigh Rd at Winkleigh. 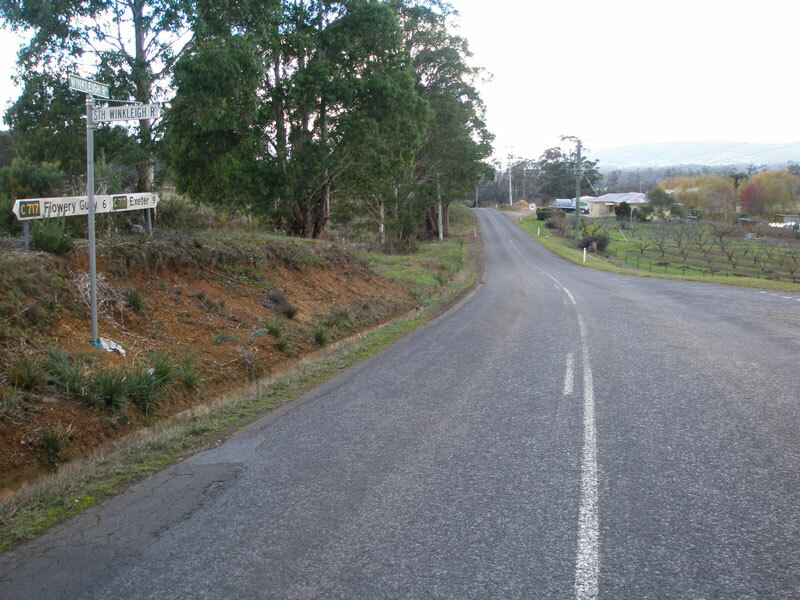 Note the fingerboards facing Winkleigh Rd, despite it not having a route marker. 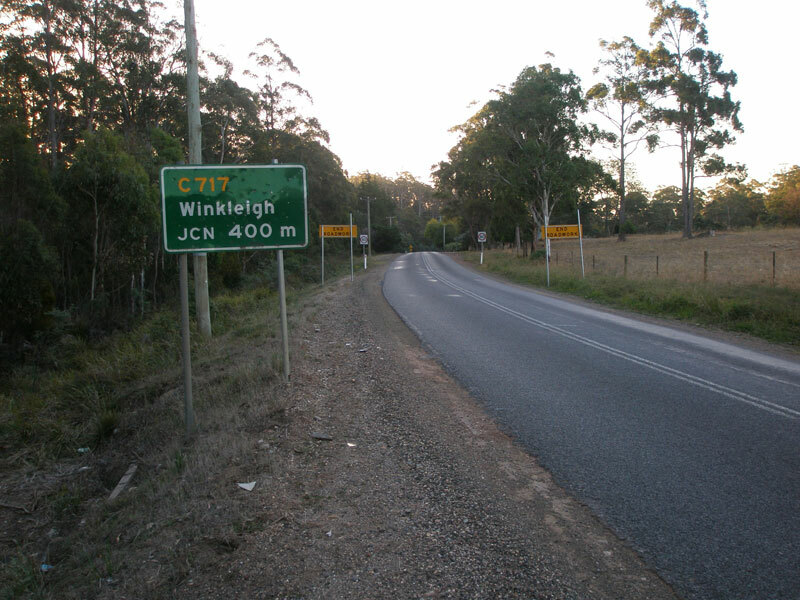 Deteriorating fingerboards at the intersection of Winkleigh Rd (C717) & South Winkleigh Rd, Winkleigh. 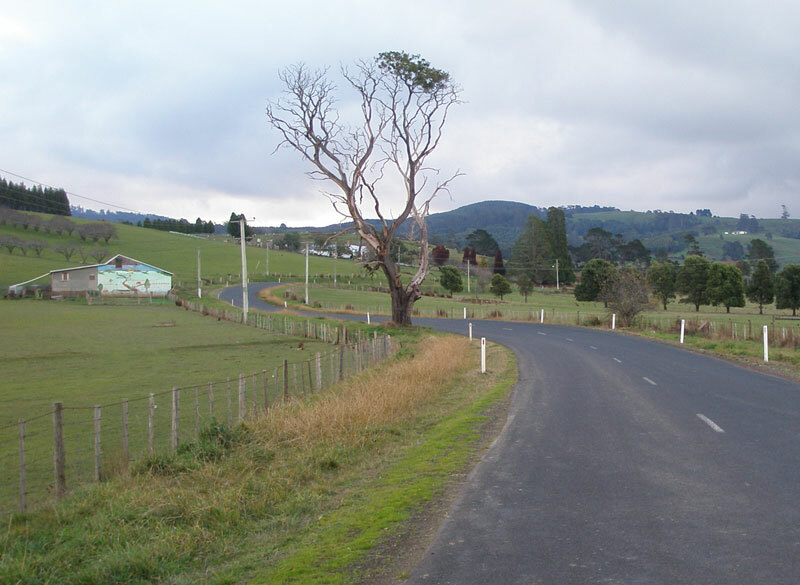 At Winkleigh, Winkleigh Rd (C717) becomes Flowery Gully Rd - this view is looking north through the locality of Winkleigh. 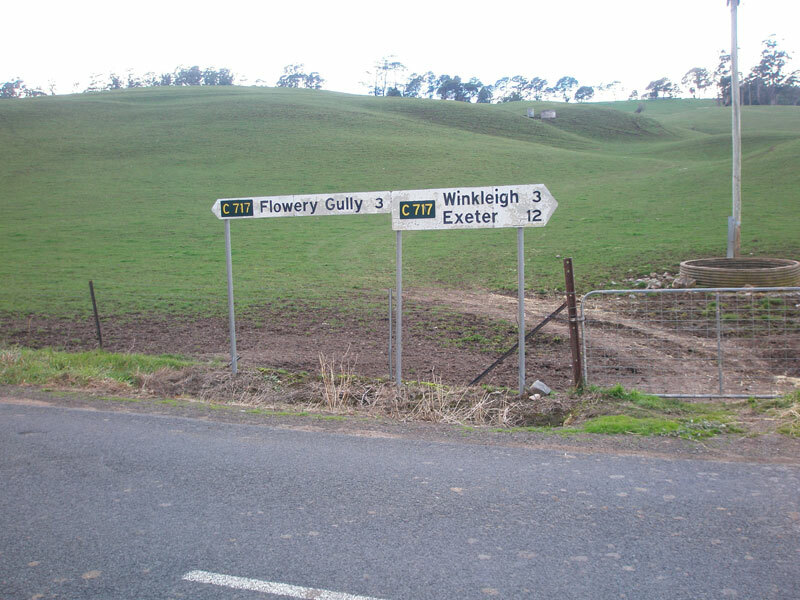 Flowery Gully Rd (C717) looking south at Winkleigh - a small Presbyterian Church is on the left. 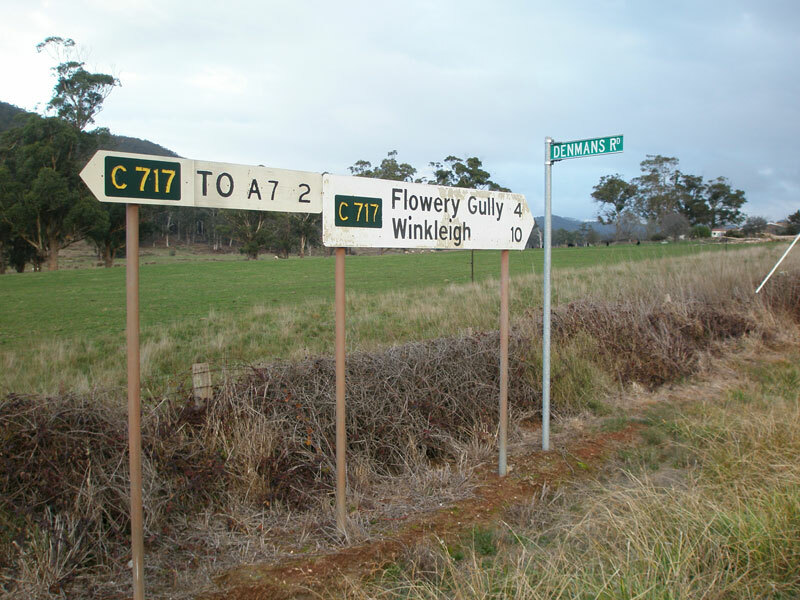 Flowery Gully Rd (C717) looking north as it leaves the locality of Winkleigh. 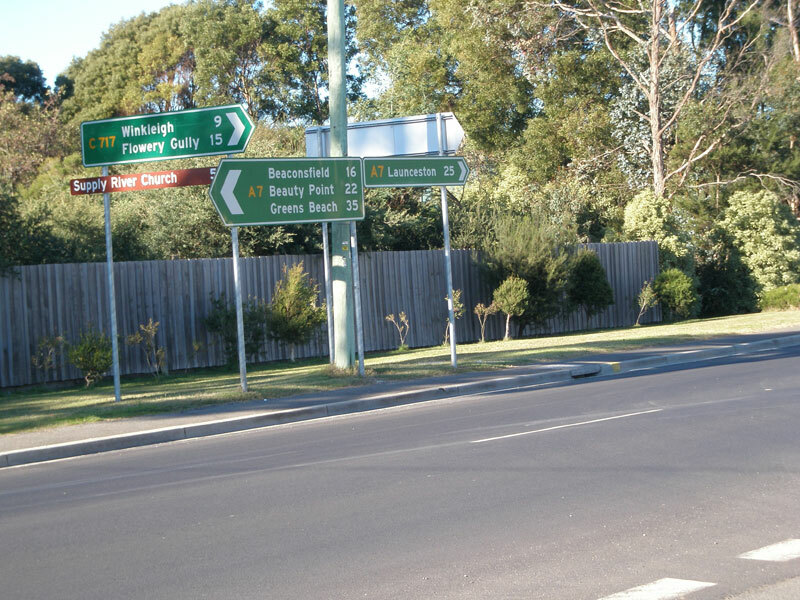 Deteriorating fingerboards at the intersection of Flowery Gully Rd (C717) & O'Reillys Rd. 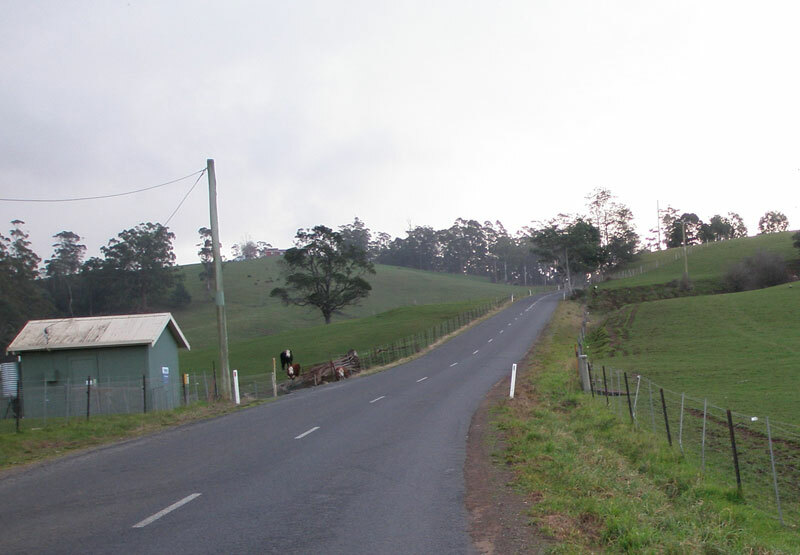 O'Reillys Rd, like South Winkleigh Rd, provides a link between the C717 and the C716, which runs parallel but about 5km to the west in another valley. 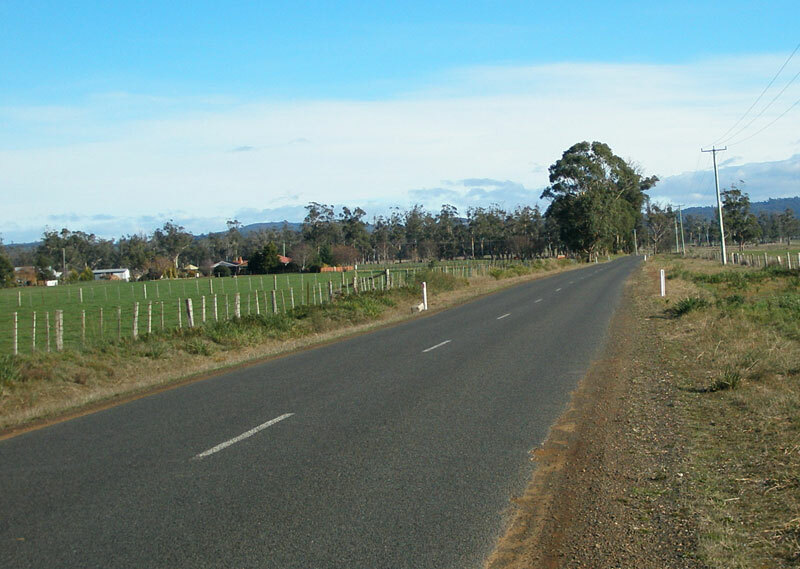 Flowery Gully Rd (C717) looking north from the junction with O'Reillys Rd. 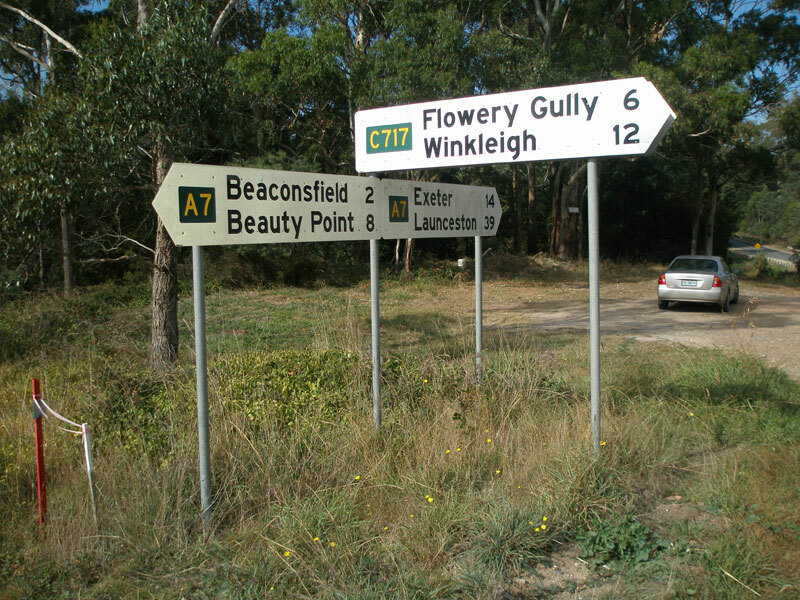 Flowery Gully Rd (C717) northbound as it descends towards Flowery Gully. 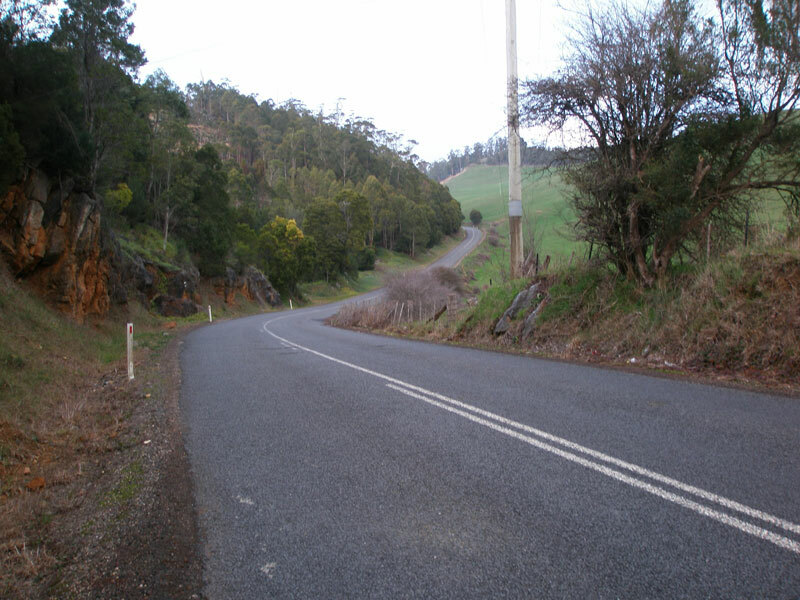 Flowery Gully Rd (C717) looking north on the descent to Flowery Gully. Flowery Gully Rd (C717) looking south through the locality of Flowery Gully. 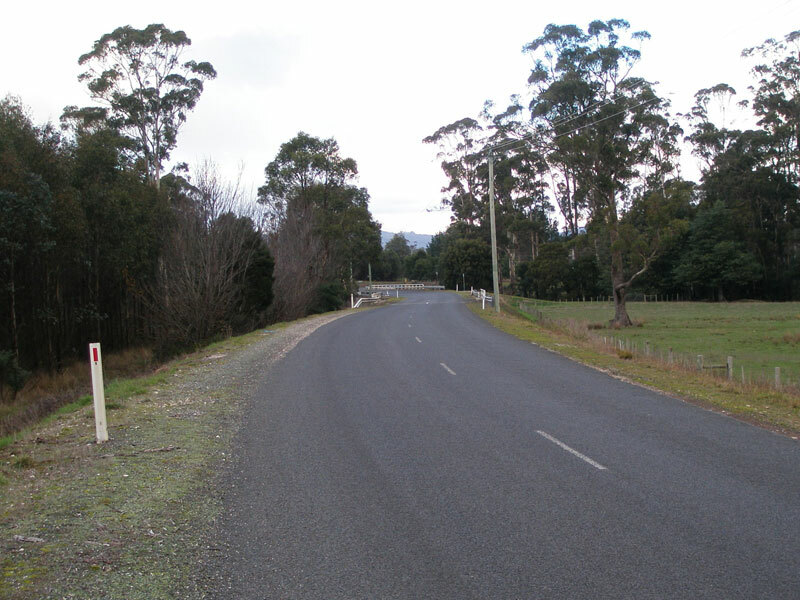 Fingerboard signs at the junction of Flowery Gully Rd (C717) & Denmans Rd, 4km north of Flowery Gully. 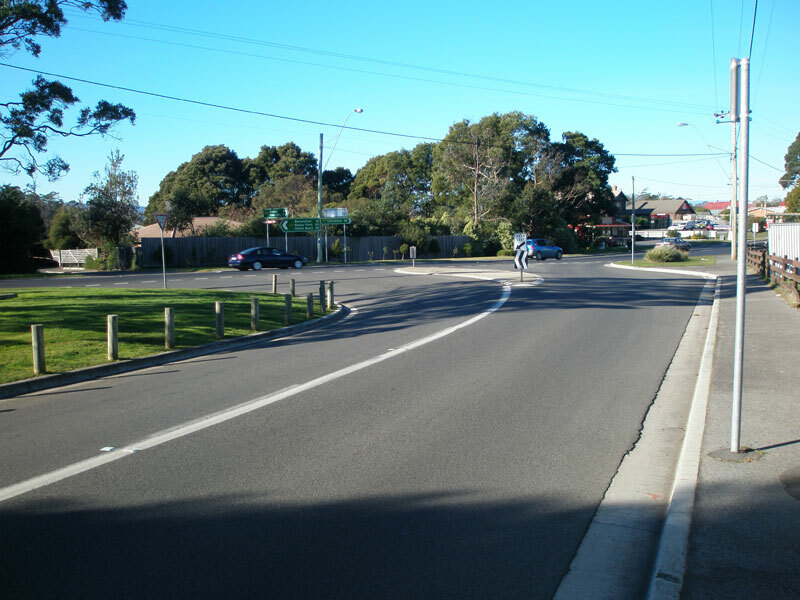 Denmans Rd is an unsealed link between C717 and the C715, which runs parallel about 5km to the west. 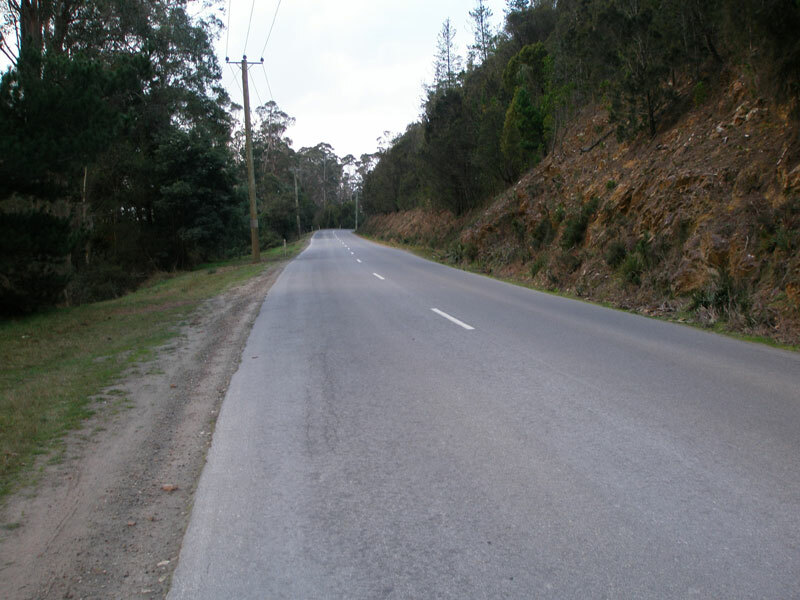 Flowery Gully Rd (C717) looking north from the junction with Denmans Rd. 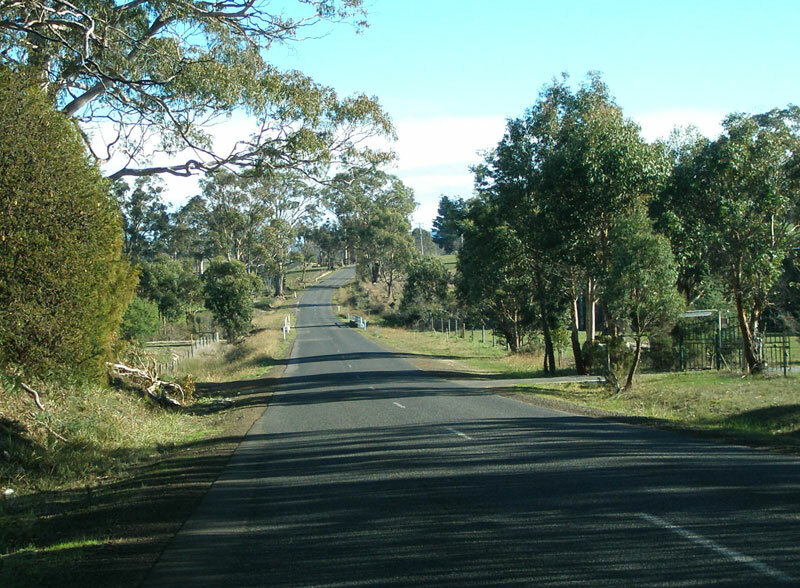 Not far to the West Tamar Highway (A7) now. 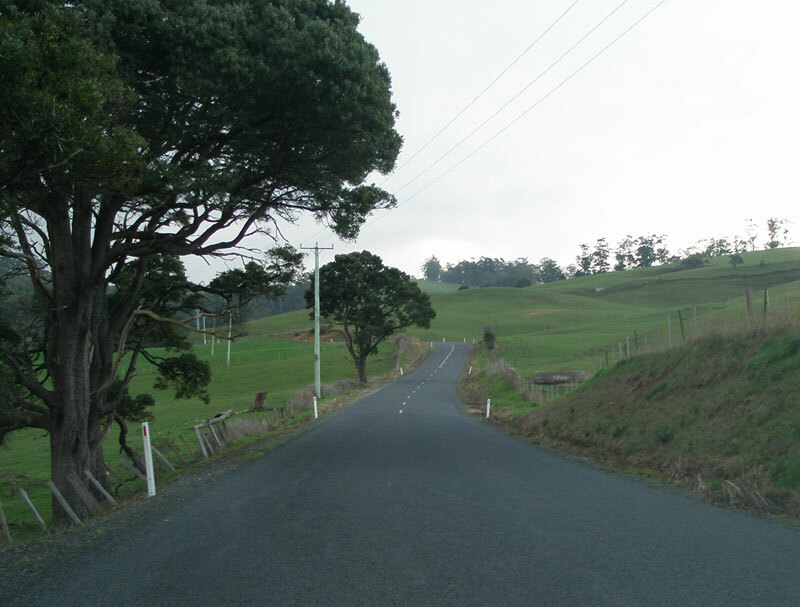 Flowery Gully Rd (C717) looking north as it descends to the Tamar River valley where Beaconsfield lies. 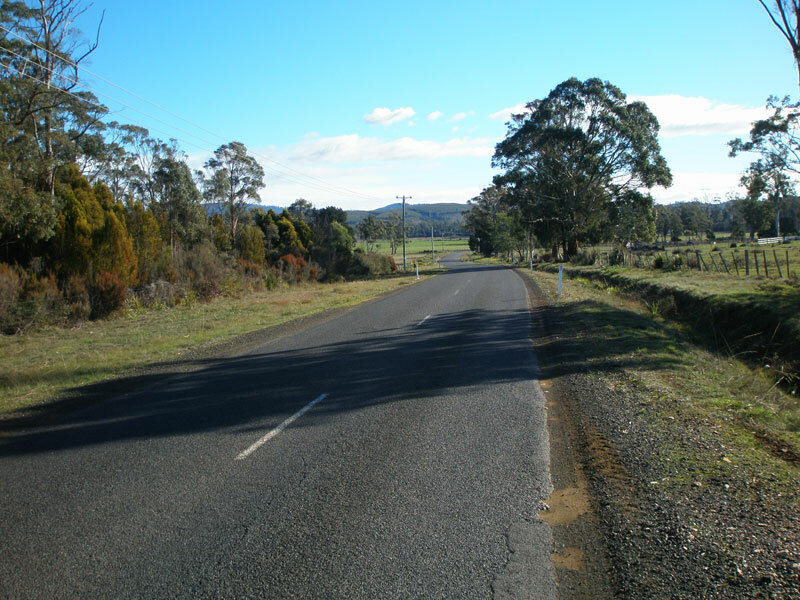 Flowery Gully Rd (C717) looking north approaching the junction with West Tamar Highway (A7). 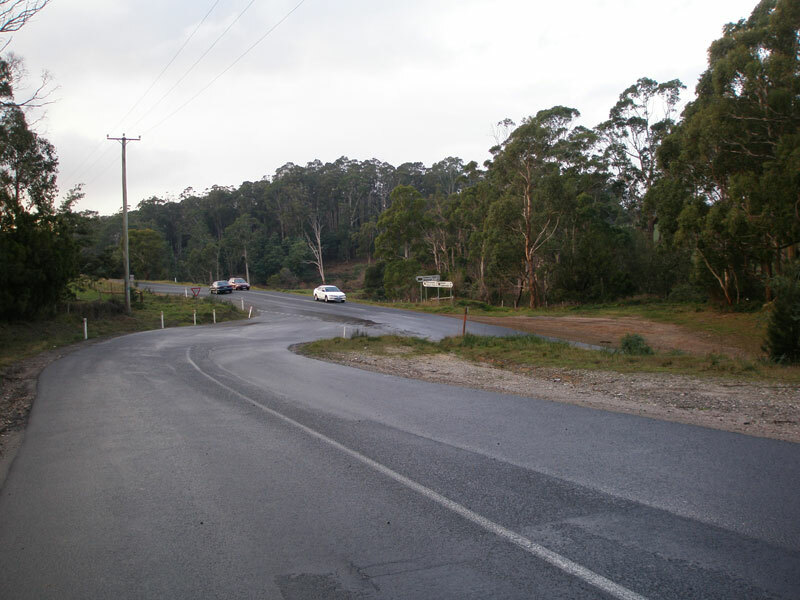 Looking south on West Tamar Highway (A7) at the junction with Flowery Gully Rd (C717), 2km south of Beaconsfield. 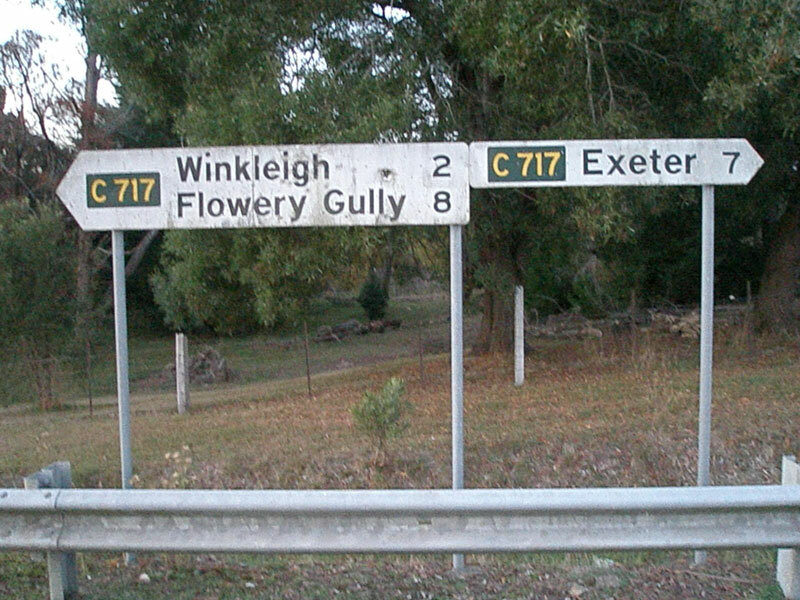 Fingerboard signs at the junction of West Tamar Highway (A7) & Flowery Gully Rd (C717), 2km south of Beaconsfield. 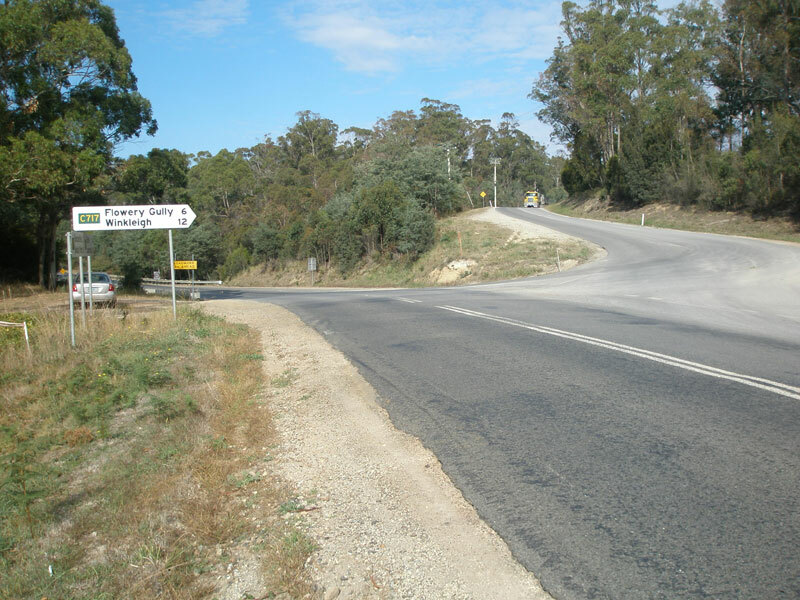 West Tamar Highway (A7) northbound approaching the junction with Flowery Gully Rd (C717), 2km south of Beaconsfield. 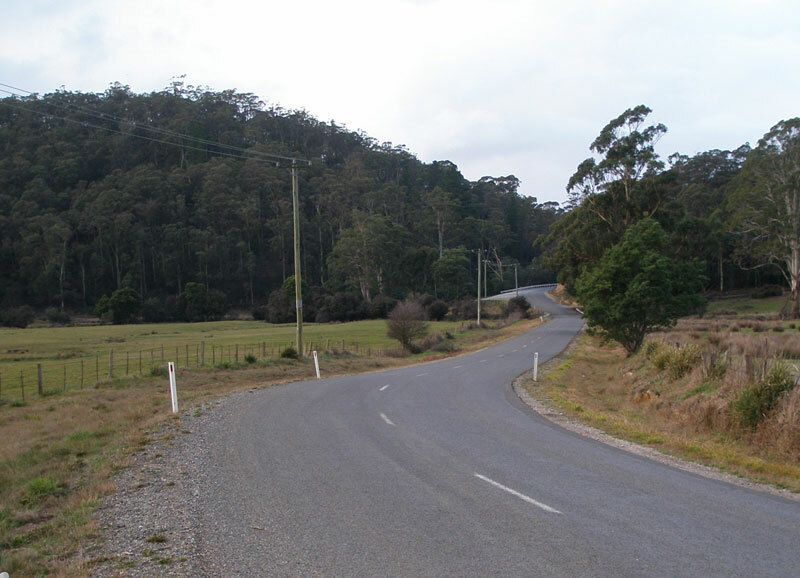 West Tamar Highway (A7) southbound approaching the junction with Flowery Gully Rd (C717), 2km south of Beaconsfield.